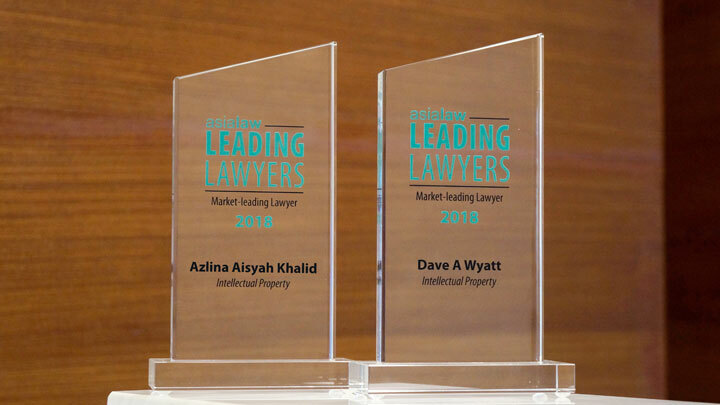 It is with great pride that we announce our Executive Director and Head of Patent and Industrial Design, Mr Dave A Wyatt together with our Senior Legal Counsel, Ms Azlina Aisyah Khalid have once again made the cut in the Asialaw Leading Lawyers publication. Asialaw Leading Lawyers features prominent practitioners in 18 practice areas across 24 jurisdictions in the Asia-Pacific region. The publication is the result of an extensive online survey of in-house counsel and private practitioners, who can nominate up to three lawyers they believe should be in the publication and give reasons why. Thereafter the nominations are analysed and screened for firm, network and alliance bias, and these individuals are further divided into three categories of market leading, leading and rising star. Dave and Azlina are listed as Market Leading Lawyers in Intellectual Property. We are proud of their achievements and hope this accolade places the Firm on track in continuing to provide excellent client services.